Quick Turnaround, Full Service In House Digital & Offset Printing Company. We Print Everything From Business Cards to Banners! 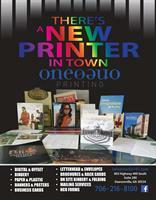 10% Off All Printing From Studio One O One Printing to Any Chamber Member! Our mobile Apps are furnished FREE as a community service. The App will be your one-stop mobile tool for finding “Community & Town” information such as Chamber of Commerce, and County and City Government information and web links. Other items like contact names, telephone numbers, websites, and more for schools, churches, restaurants, and other businesses within each local community are also included. Find or request an App for your community and town today.